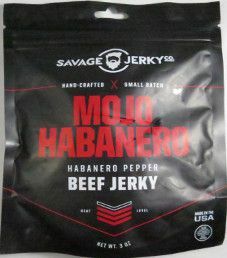 The Savage Jerky Co. brand name was launched in 2014. They are located in Lawrenceville, Georgia. On a road trip in the summer of 2013, the owners Brad and Michelle Summey were disappointed with the jerky selection at gas stations. In their words: “full of the same mediocre, dry and often bland varieties of beef jerky”. Less than a year later Savage Jerky Co. was selling four different flavors of beef jerky. Today, they sell nine different flavors, and a new line of three traditional flavors is set to be introduced later in the year. 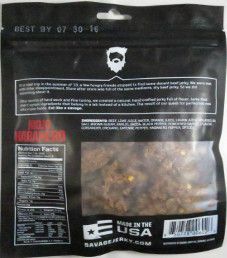 Their jerky is advertised as natural, and hand crafted, which has a unique flavor. 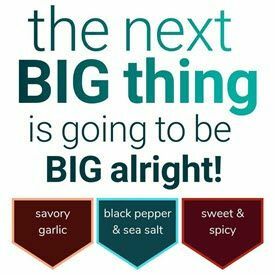 Ingredients: Beef, Lime Juice, Water, Orange Juice, Lemon Juice, Molasses, Sea Salt, Brown Sugar, Garlic, Onion, Black Pepper, Powdered Garlic, Cilantro, Coriander, Oregano, Cayenne Pepper, Habanero Pepper, Spices. We have an interesting citrus based liquid marinade consisting of lime juice, water, orange juice, and lemon juice. Juices are decent, but overrated on how healthy they are. The heat comes from the cayenne pepper and habanero peppers. As a general rule, hot peppers are healthy if eaten in moderation, to flush toxins out of your body. Garlic and onion offer many health benefits. Many of the best spices in the world are used here. The most interesting spice used is oregano, which contains many essential vitamins. The sugar level used here is highly respectable at only 1 gram of sugar per 28 grams of jerky. The salt level is also quite respectable at 150mg of salt per 28 grams of jerky. 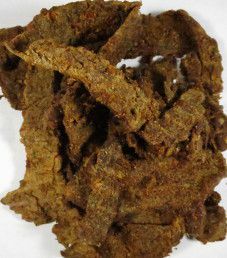 This jerky does qualify to have no sodium nitrite, or any other similar unhealthy preservative. It is great to see that mineral rich sea salt is used as the main preservative, as opposed to highly refined table salt. Also admirably, there is no MSG added. 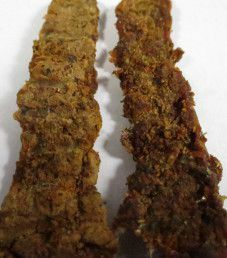 These jerky strips are medium in size, and sliced to a medium thickness. There is a somewhat dry texture, but not overly dry. The texture is about perfect, and relatively easy to chew. There are no visible signs of fat, and handling this jerky leaves no residue on your fingers. The strips are visibly coated with spices. The first taste detected is a citrus flavor, where both the orange and lime juice stand out. It does not take long for the heat from the habanero peppers and cayenne pepper to set in. This flavor is advertised to have a heat level of 3 out of 4, which is pretty much accurate. The juices help to a certain extent in offsetting the heat. There is very little sweetness, which allows a fair amount of natural beef flavor to be present. The saltiness is at a mild level, and the onion and garlic are at a light level. An interesting twist to this flavor are the many spices used. The oregano, cilantro, and coriander are all fantastic tasting. Overall, a great tasting hot based flavor that delivers on all levels. 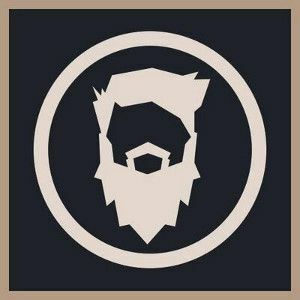 Their slogans are “Hand-Crafted”, “Small Batch”, and “Eat like a savage”. The flavor is described as “Habanero Pepper”. I don’t like the texture at all. Like formed ground meat. Flavor was good though. Thanks for the feedback Wendy. I am convinced that Savage Jerky Co. uses brisket as the cut of beef. Brisket is known to have a tender texture, which is part of what makes it popular.